Knoco stories: Why governments screw up. 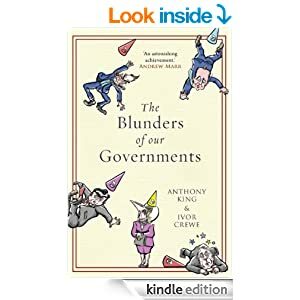 As part of my holiday reading, I read a book entitled "The Blunders of our Governments", by Anthony King and Ivor Crewe. Initially I feared this might be heavy going, but quickly I became enthralled and appalled by the scale, cost and consequences of the recent mistakes of the British Government, and equally fascinated by the analysis of why these blunders happen. I suspect other governments are not immune to blunder either, and that the conclusions of the book may be generic. There are also some issues here of knowledge management and a learning culture, as I explain later. Here are just a few of the blunders analysed in the book. The decision to raise a "per capita" local tax to replace a local property tax. This was known as the "Poll Tax" - deeply unpopular and totally impractical, it caused riots in the streets, and precipitated the fall of the Prime Minister at the time, Margaret Thatcher. It was abandoned after three years as being totally unworkable. The introduction of a personal pension scheme without proper consumer protection, which resulted in widespread mis-selling and "hard selling" of pension schemes to people without the knowledge to be selective buyers. This has since become a major public scandal, with potentially more than a million people adversely affected; many of them old, poor and/or ill. The creation of an exhibition to mark the Millennium. It's purpose was to impress, entertain and educate, and it failed on all counts. Costing £828 million in government spending, it received only £189 million in income from visitors and investors during the millennium year. The ill-fated and hugely complex Metronet contracts to upgrade the London Underground, which led to a direct loss to the taxpayer of between £170 million and £410 million. The creation of several overambitious IT systems abandoned after massive investment. These include a system to handle asylum and refugee cases abandoned at a cost of £77 million, a system to handle prisoners and other offenders which trebled in cost, and a centralised system for health records that was eventually abandoned after estimated costs of many billions of pounds. So why does the government make such big mess-ups, wasting such huge sums of money and creating massive schemes that never work? The authors conclude that most of the causes are structural and systemic issues. The people who make the policy are culturally disconnected from the people who will be affected. The idea of a per-capita tax made perfect sense to a government minister, but no sense at all to a low-income resident in rented housing. This is exacerbated by the lack of piloting of many of these schemes. The pervasive phenomenon of Group-think or "Information bubbles" means that ministers making decisions inhabit a bubble, receiving information and knowledge only from a few like-minded sources. The short-term pressure from the media to be "seen to be doing something"
What the authors call "asymmetries of expertise". In other words, ministers are not project managers nor IT experts, and cannot act as "intelligent customers". Instead they rely on external legal and consultant support, which may result in conflict of interest, as well as increasing price tags. The biggest governmental knowledge gaps, according to the National Audit Office (NAO), are in contract management, commissioning and management of advisors and consultants, risk identification and management, and business acumen. The NAO also recognised a "limited ability to embed skills and experience" (linked to the rapid movement mentioned above). An imbalance of decision-making over deliberation. That's why governments screw up - but why don't they learn from these screw-ups? Why keep repeating the same mistakes? A "knower" culture rather than a "learner" culture. There are massive skills and knowledge gaps in the Government, and yet there does not seem to be a burning desire to fill these gaps. Decision makers seem to rely on what they Know, even when that knowledge is culturally disconnected and intellectually prejudiced, and when knowledge gaps are identified, these seem slow to be filled. A lack of honesty and "telling truth to power." The powerful, decisive and ambitious nature of ministers makes it difficult to say "this will never work". The book mentions how difficult is can be to tell a powerful politician what they don't want to hear, or why their pet project is doomed to fail..
A lack of challenge to the "accepted wisdom." Without this challenge, the problem of GroupThink never goes away. Where were the focus groups, the pilots, the "devils advocates? Where was the willingness to ask "are we missing something? Do our assumptions stand up to challenge"? With no challenge, mistakes perpetuate. Short termism. This is perhaps the biggest issue - that most or all governmental incentives are short term. A week is a long time in politics, so who bothers to think 5 years ahead? The incentives are all in favour of being decisive and not deliberative, of acting and being seen to have acted, and then moving on. The long term incentives are just not there, as shown by the lack of accountability mentioned above. To change the culture of an entire government would be a massive job, being so closely linked to historical structures and to the entire culture of the country. Many of the pressures that drive governmental behaviour are externally imposed, for example by the media "blame game". However no industrial organisational structure would be allowed to survive unchanged after such a string of massive blunders, so why should the governmental organisation? Most of these blunders have been analysed by the National Audit Office, who produce about 60 reports a year analysing how government projects, programmes and initiatives have been implemented and how services can be improved. There must surely be an excellent case for a thorough lessons analysis, to find out and fix the problems at the heart of governmental blunders. Very interesting entry. Thank you. And I would say that all those issues are regardless of corruption (which, in my country, is pretty high, too). I would add the tribalism of what passes for political discourse is also responsible, whereby many options are automatically rejected because of their source (I.e. Left, Right etc.) rather than their merits. Throw in a short-termist news cycle, a ridiculously fickle public and press who punish honesty whenever its (rarely) exhibited and it is hardly surprising that few medium- to long-term projects ever succeed. We get the politics we deserve, alas! Very good post Nick. This is an excellent example of why I transformed from an organizational consultant to a systems architect as the audits in the former made it painfully clear that without much better systems in place, our governments and modern way of life may not be sustainable even in the mid-term, especially given the nature of complex systems and the neural network economy where realization of systemic risk is all but certain without highly specific design and functionality. Well done.